Copyright® 2000, Assessment.com International Assessment Network Ltd. ZHComputer. All rights reserved Click To Begin Informational Presentation on: Student. 9 Copyright® 2000, Assessment.com International Assessment Network Ltd. ZHComputer. All rights reserved General MAPP Information: Who are we? The International Assessment Network, doing business as Assessment.com as well as Student.Assessment.com, is a Minneapolis, Minnesota-based corporation dedicated to providing companies and individuals with personalized and comprehensive internet-based assessments that help people reach their maximum potential. 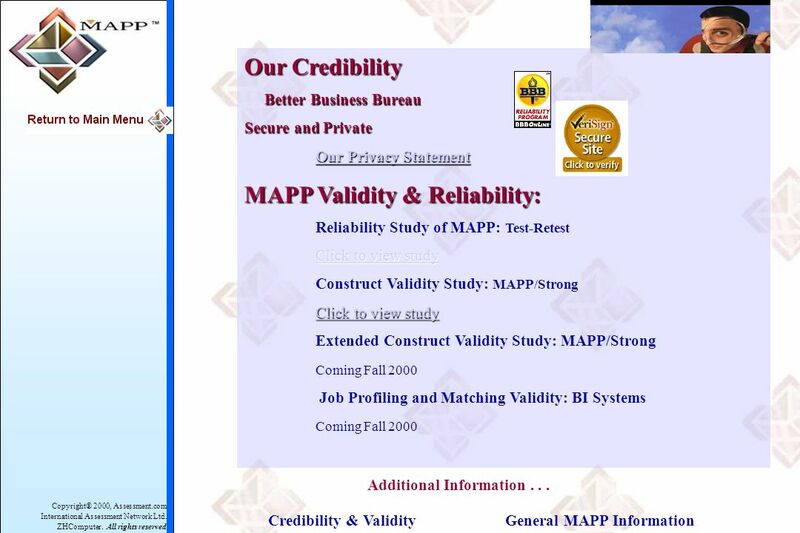 What is MAPP? 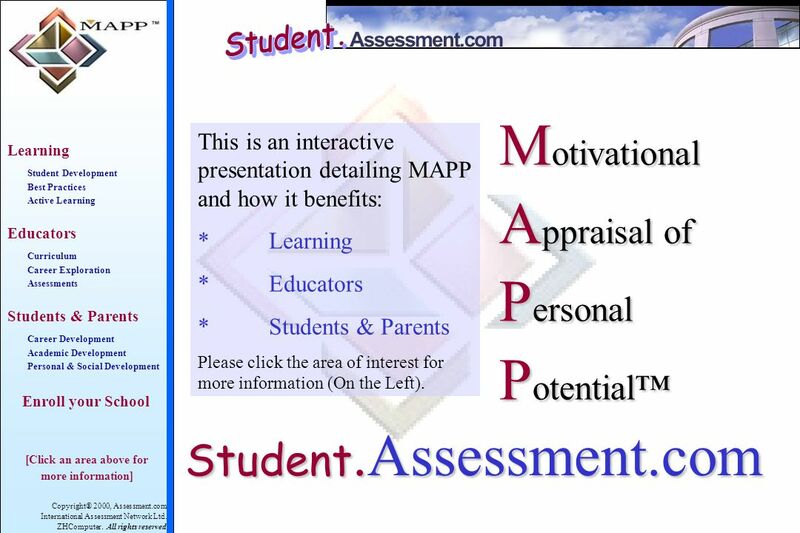 MAPP stands for Motivational Appraisal of Personal Potential. The Student Assessment is based on an individual’s motivations toward given areas of work. 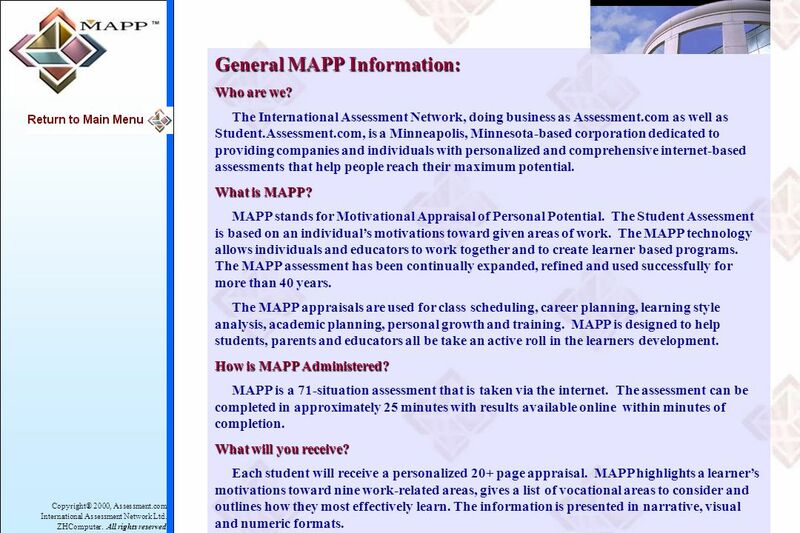 The MAPP technology allows individuals and educators to work together and to create learner based programs. The MAPP assessment has been continually expanded, refined and used successfully for more than 40 years. The MAPP appraisals are used for class scheduling, career planning, learning style analysis, academic planning, personal growth and training. 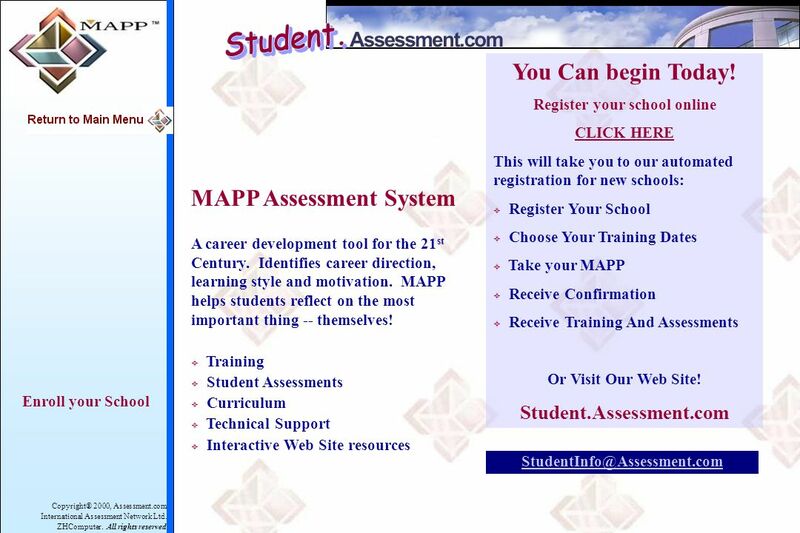 MAPP is designed to help students, parents and educators all be take an active roll in the learners development. 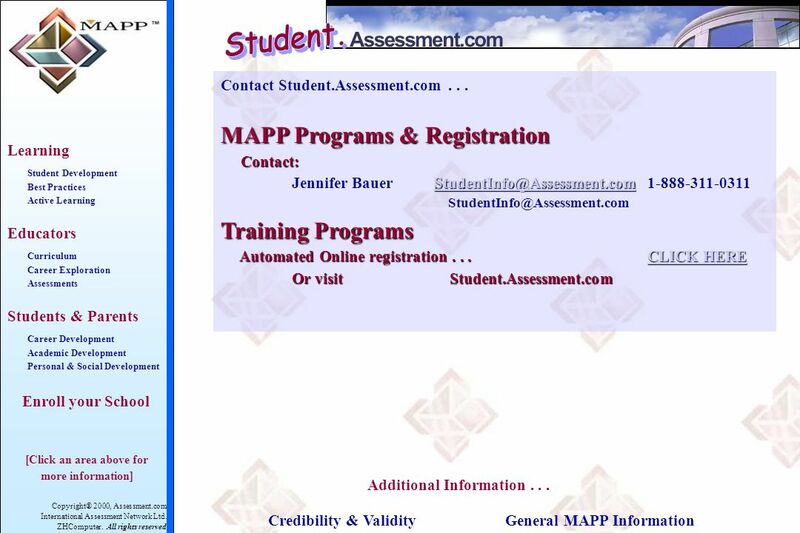 How is MAPP Administered? 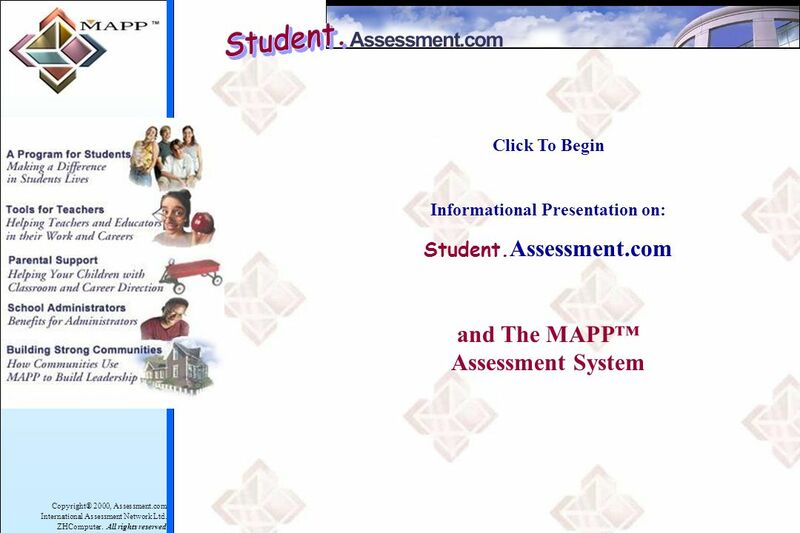 MAPP is a 71-situation assessment that is taken via the internet. The assessment can be completed in approximately 25 minutes with results available online within minutes of completion. What will you receive? Each student will receive a personalized 20+ page appraisal. MAPP highlights a learner’s motivations toward nine work-related areas, gives a list of vocational areas to consider and outlines how they most effectively learn. The information is presented in narrative, visual and numeric formats. Download ppt "Copyright® 2000, Assessment.com International Assessment Network Ltd. ZHComputer. All rights reserved Click To Begin Informational Presentation on: Student." Best Practise in Using Finance Simulations in UK Higher Education By: Neil Marriott and Siew Min (Amy) Tan. G t Plans? Get College. College Preparation Lesson Plans Sourced from the “Sparking the Future” program from the State of Washington. “Got Plans? Get. Presented by: Lake Land College Counseling Services. © International Baccalaureate Organization 2006 The Diploma Programme At a Glance. This interactive flow chart takes you through a number of questions in order for you to devise your own career plan as part of your learning and personal. 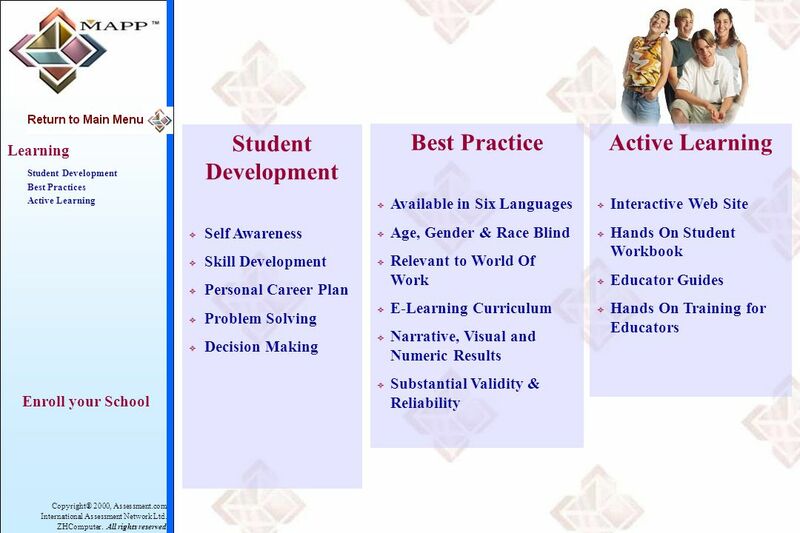 Key Messages Learners need to know  What skills are available  When to use them  Why they are appropriate for the task  How to apply them to achieve. A NEW VISION: The WI Comprehensive School Counseling and Individual Learning Plans Presented by Gary L. Spear, School Counseling Consultant, WI Department. IT is it! Overview of IT Exploration Curriculum Presenters Cindy Drahos (High School Teacher, Burnsville High School) Firasat Khan (Director of Academic. 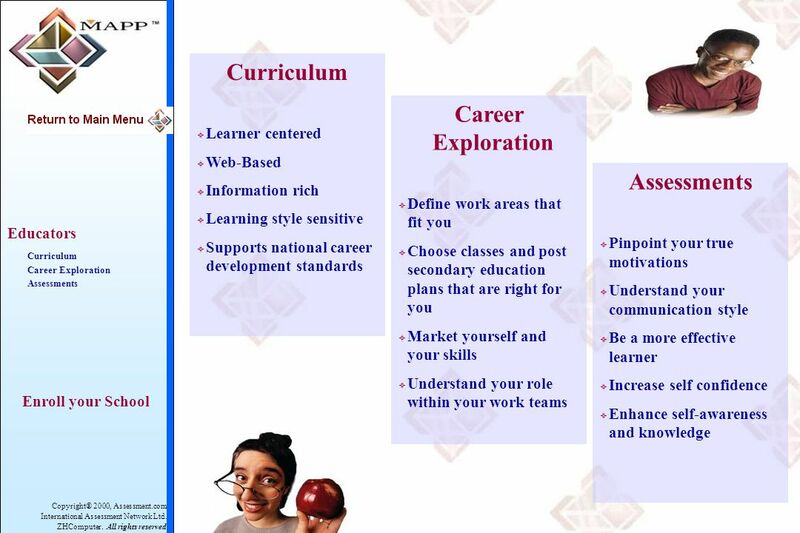 Career Cruising Your child’s program for future career success. Collaborative Learning Activity Students Assessing Teaching and Learning Program. Resource Support for Career Counseling. 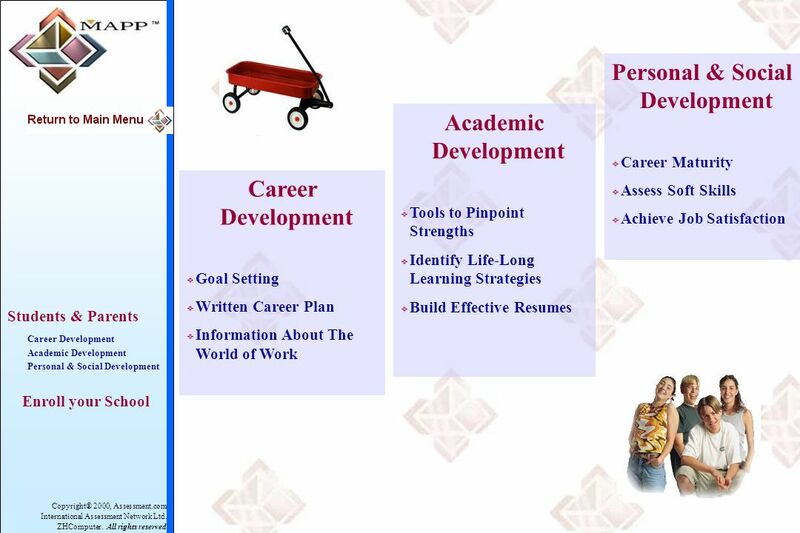 What is career counseling Counseling is the means by which one person helps another through purposeful conversation. Intel Teach Program Shelley Shott Intel Corporation April 2010. “Choosing a Major” Project UI100: First Year Seminar. Kuder ® Career Planning System The sky’s the limit! Interview Questions: W5 and S.T.A.R. In today’s tough job market, you need to stand out from the crowd. Presenting an impressive resume to potential employers will greatly increase your chances.